We are pleased to announce that AJ Plumbing Supplies have agreed to continue as our Title Sponsor in 2019. AJ Plumbing Supplies have several outlets in Northern Ireland, Ballynahinch, Newry and Banbridge and we would ask the competitors and spectators to support the businesses that supports our sport. Metzeler Tyres once again have provided a package of product prizes for the Superbike, Supersport, Supertwin and Pre Injection classes, a total award tyres package worth of £12k. 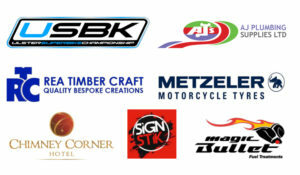 Associate sponsors also return, Chimney Corner Hotel under Loughview Leisure Group Ltd, Rea Timber Craft – Crumlin, Signstik – Dundrod and we welcome Magic Bullet Fuel Treatments onboard, who will provide awards for the Junior Cup/SS300 and Young Guns at each event. Round one of The 2019 USBK Championship was completed at Bishopscourt on the 30th March, it was a great opening event to the 2019 season and promoted by the Temple Club. It was encouraging to see the number of spectators that attended, which was up on last years event, we hope this will continue for the rest of this season. We now look forward to the Easter Weekend when Rounds 2 & 3 take place. 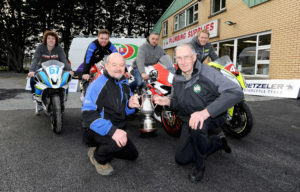 The 43rd Enkalon Trophy Races on Easter Saturdays Round 2 at Bishopscourt . 9am practice and the race program from 11am. Current USBK Superbike Champion and 2018 Enkalon Trophy winner Gerard Kinghan will be out to retain the trophy and score some valuable USBK points after an incident in Round 1 left him with zero points. The Superbikes have a stronger field of competitors this year and the racing should be a lot closer. Ali Kirk, Aaron Armstrong, David Haire, Ryan Gibson, Nico Mawhinney, Gary McCoy and current championship leader Carl Phillips all capable of winning, also in contention will be upgraded competitors Barry Graham, Stephen Magill. We welcome back for Easter Scottish visitors Donald McFadyen and Kris Duncan, we hope they enjoy their racing weekend. 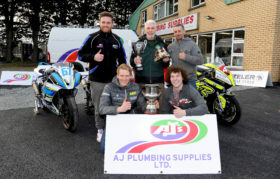 Supersport class has Mark Conlin, Christian Elkin, Jack Waring, Derek Craig, Darren Keys and Brian McCormack entered. Other classes include SS300, Young Guns, Junior Cup, Pre Injection, Supertwins, Sidecars, Cup, Lightweight Supersport and Moto 3. Round 3 on Easter Monday. The King of Kirkistown is the main event. It was First held in 1968, the last running of the race was staged in 2010, when Marshall Neill added his name to an illustrious list of past winners, including Gerry Mateer, Tommy Robb, Abe Alexander, Ray McCullough, Noel Hudson, Ian McGregor, Alan Irwin, George Farlow, Steven Cull and Phillip McCallen. Joey Dunlop was also crowned King of Kirkistown during his unprecedented career and remains the only rider ever to win the feature race three times, taking wins in 1975, 1977 and 1980. All the main contenders from Easter Saturday are entered at Kirkistown and will surely be wanting to get their hands on this Trophy. Practice at 9am and racing from 1pm. Again, all the championship classes are catered for except for Classics. The ten round USBK Championship has two rounds in April, June and September. One in March, July, August and October. The first time for the Enniskillen Club to host the Final round at St Angelo on the 5th October.